If you want to get fit, let man’s best friend lend a paw. Research suggests that dog owners are 34% more likely to walk for 150 minutes a week than those without. But walking a dog is so last year! Transform your routine with these unusual activities. You’ll be too busy bonding with your pet to notice you’re getting buff at the same time. If you’ve ever tried yoga at home, you’ll know dogs love to get involved (or in the way!) Well now you can let the experts show you how downward facing dog should be done. Partner up with your pooch and flow from pose to pose. Doga fosters a feeling of calm in both dog and owner. It can even decrease blood pressure and improve separation anxiety. What happens if you mix cross country running and your canine? You guessed it. Originally an off season method to train dogs for sledding, Canicross has since sprung up as a great off-road activity for warmer weather. Simply attach your dog to your waist using a bungee rope and harness and hit the trail. Your fluffball’s endless energy will be the best motivation to keep going and provide a unique bonding opportunity too. Despite Australia’s lack of snow, we didn’t want to let Huskies have all the fun with sledding. Dog joring is a sport that links dogs up to a bike, skateboard or sled so they can pull their human behind whatever the weather. There’s local clubs all over Australia to get you started. This adrenalin ride is not for the faint hearted plus it’ll definitely get that heart rate up! The great outdoors just doesn’t look so great without a furry friend by your side. Luckily, Dog Adventures helps you find the best hikes, trails or mountain bike routes for a joint expedition. Don’t forget to pack gear for your pet as well though. They’ll need a collapsible dog bowl and perhaps even booties if the terrain is rough. Depending on the level or length of the hike, they may even need a harness, cooling clothing or their own mini pack to carry! 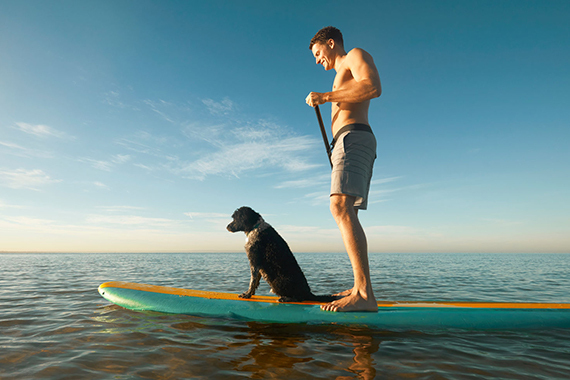 Make a splash at your local beach by training your dog in Stand Up Paddleboarding. Sup Dog Oz has been training dogs to SUP and surf for over a decade across the globe. It’s a serious workout for both dog and owner. 15 minutes of swimming and water play is said to be as much exercise as an hour’s walk. But there’s something about sharing a board that makes the bonding extra special too. When you’re hitting the cardio this summer, don’t forget your canine. There’s a world of fitness fun beyond the boring dog walk. With heaps of healthy humans and doggies to meet, you’re bound to make some new friends along the way. Pick an activity that’s suited to your dog’s energy and fitness levels then off you go! The adventure you have together won’t easily be forgotten.